Marya and I have been dreaming about cruising for over 10 years. One day, I was jabbering with a a co-worker about different types of adventures and I mentioned that it would be cool to live on a sailboat. Up to that point, I had been on my uncle’s sailboat once, and had not read anything on the subject. I’m not sure how I even got the idea in the first place. My co-worker, an avid sailor, didn’t even bat an eye, and mentioned that it was more common than you would think. The next day he handed me a copy of Cruising World magazine, and the idea started to take shape. I told Marya about it sometime later and she thought it was just another one of my crazy ideas that would soon drift away. Well, it didn’t. I started reading everything I could find on cruising and sailing and subscribed to Cruising World, Sail, Latitudes and Attitudes, Good Old Boat and Practical Sailor. The book that really clinched it for me was “The Cruising Life: A Commonsense Guide for the Would-Be Voyager” by Jim Trefethen. That book really opened my eyes to the possibilities and laid out a plan to do it. 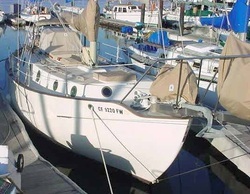 Long story short, we took sailing lessons, rented Catalina 22’s and 25’s for a year or so and then bought our first boat. Most people start out small and work their way up. But, I decided that we should just buy THE boat. Why throw away money on a boat that I would just sell later, or so I thought. While living in southern California, we bought a Westsail 32. The Westsail is a huge 32’ boat. She is a traditional cutter rigged, full keel, double-ender, and built like a tank. She displaces a whopping 20,000 lbs, has a 12’ beam and measures 40’ overall when you factor in her bowsprit and boomkin. Adagio, as we renamed her, was built in 1976 and had gone through a recent refit. However, her interior was mostly dismantled and needed a lot of work cosmetically. We spent the better part of 4 years putting her back together and sailing her in between projects. The main projects were redoing the headliner out of white beadboard and rebuilding the v-berth. I also created a folding table/cabinet. But we were naive to think we could stay on the west coast forever. Both of us loved that boat and it broke our hearts when we sold her when the Marine Corps relocated us to the east coast in 2006. We lived in Virginia for a year and then moved to Maryland, Patuxent River, right on the Chesapeake Bay. We had been going through boat withdrawal and began looking for a boat, knowing we couldn’t miss the opportunity to sail the famous Bay. We initially bought a Hunter 28, telling ourselves that we should just get a small boat to sail the bay for now... besides this was a three year duty assignment and who knew where I would be stationed next. The broker laughed when we told him our last boat was a Westsail 32 – nobody goes down in boat size, they always want bigger. Moondance was a good little boat and was in great shape, but we kept thinking that the little bit of money we spent on upkeep could be going towards THE boat. I was also pretty confident that I could remain on the east coast after the current tour ended and until I retired from the Marines (which I would later find out to be a completely wrong assumption). So, after a year, we put her up for sale and started looking again.